Now in its second year, this volunteer-led art group continues with an expanded selection of traditional drawing and painting supplies. Adults of all artistic skill levels are welcome to meet and create art independently (without instruction) in a cooperative studio environment. 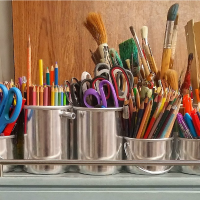 Art supplies are provided, but participants are welcome to bring their own as well. Please register individually for each date you’d like to attend. Sign up at the reference desk, by calling 482-7911 x2, or by clicking the button below.